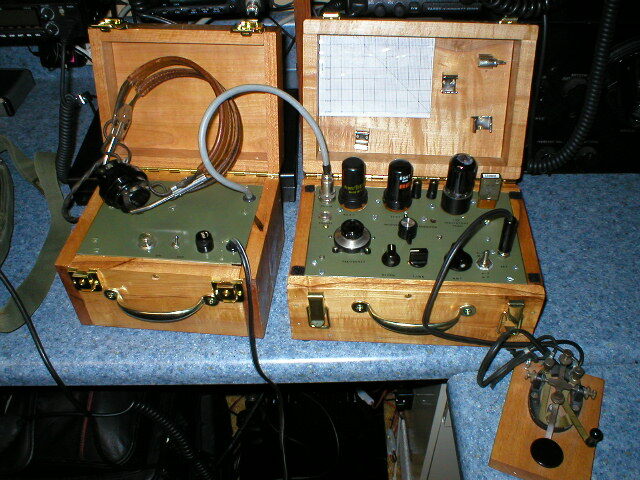 Welcome to my WWII Spy Radio called a "Paraset"
This is The Paraset World War II Spy Rig. It is on 40 and 80 meters. I built it in a wooden box . The orginal units were built in metal boxes and some were built in little wooden boxes. Some were even built in old suit cases. Great little rig! Below I have pictures of my other Parasets I have built. I have very much enjoyed operating these rigs on the air using Morse Code to contact other Ham Radio Operators. Many "Hams" have built this rig and are using it on the Ham Short Wave Bands in Honor of those who built and those who used this little radio "behind the lines" during WWII .Their courage and devotation has resulted in them being called "The Greatest Generation". I am proud that my Dad was a member of that generation. If you would like to join our Paraset Builders Yahoo Group please email me : michaeltylerwv@yahoo.com and we will sign you up.